Americans Act Now! Your Net Neutrality is Under Fire Again!! Our Internet Freedom is Under Attack (again)!! 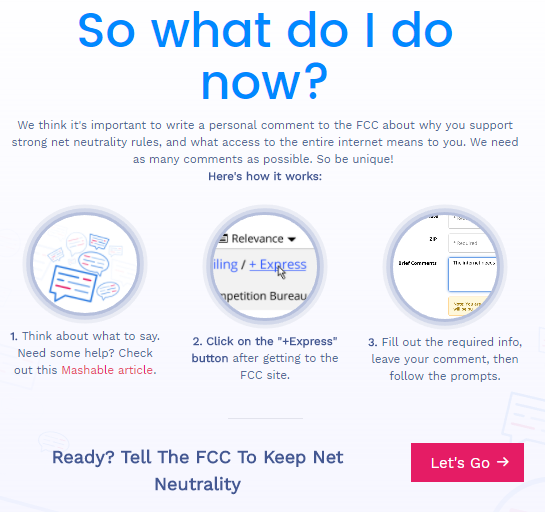 NET NEUTRALITY: ACT NOW OR THEY WILL WIN! "The internet is a utility, like water or electricity." -TB The water company has no right to charge you more or less depending on what you use water for. It has no right to prioritize water accessibility to companies over residences, and therefore it is a fair utility system. Congress wants to abolish this level of fairness on the internet. They have created a deliberately misleading name for their newest Act aimed at destroying the fairness and freedom of the internet. The "Restoring Internet Freedom Act" will do just the opposite of what it's name implies - it will remove the internet freedom we now enjoy. It will allow internet service providers such as Comcast to throttle your residential internet speed in favor of companies and advertisers who pay more to have priority access to the same internet lines. By selling the "fast lanes of traffic" to companies, you will be subjugated to much slower lanes of internet traffic, and will notice a clear decrease in your internet speed. When we talk about online gaming, this means you will have a massive increase in Latency which is the primary cause of "lag" - noticed in game when you dive behind a solid wall to avoid getting shot, only to get riddled with bullets anyway because you were not behind the wall when you though you were (you arrived later, based on your internet latency). Any increase in this latency and we will be going backwards in time with regards to the improvements we've seen in online gaming over the past 10+ years here in America. If you live in the United States, you must act now to help protect Net Neutrality and our internet freedoms. Thousands of Comcast bots have reportedly pushed the United States Congress to believe that consumers WANT a throttled internet that favors Companies, Corporations, and Advertisers over residential consumers (all of us). Using these duplicitous means, Comcast and others have twisted the facts and impressed opinions upon our Government that do not represent the true opinions and values of the American public. Using a name for their act such as, "Restore Internet Freedom", is the lowest form of deception! It is like to forcing Apple loving people to take Oranges out of a bag labeled "Bag of Apples". No one should be stupid enough to fall for such childish tactics, but the supporters of this Act do not give the American public much credit at all. The Restore Internet Freedom Act will remove the freedom you now enjoy on the internet - you currently enjoy the same rights and speeds and priorities of everyone else on the internet, including businesses, schools, and government facilities. If this Act passes, you will LOSE your internet freedom and the power will shift to companies and organizations who can afford to pay for priority traffic and speed. If the incorrectly named "Restore Internet Freedom Act" passes, you will only gain the freedom to pay more for the same speed you currently enjoy as these Internet Service Providers restructure their subscriber agreements into two clearly defined speed groups where the residential customer (us) has no option to pay (even if they were able to) at the same level as a commercial customer and can never afford the same priority traffic lanes on the internet. Right now, you notice nothing because the packets of info you send through the internet to access a website, or play a game online, travel alongside everyone else's packets at the speed of the lines inbetween. If this Act passes, your packets will get passed as well - they may be pushed to the side to allow for more "important" packets to move along internet lines. This is irrespective of any necessity; your packets could arrive too late causing problems (for gaming, this is Lag) and to minimize this you will be encouraged to pay your ISP for a higher level of access. In the end, though, you will not be able to pay for the level of access commercial customers enjoy, you will always have a tier over you that has priority access. What is this priority access speed like? EXACTLY WHAT YOU HAVE NOW! And what you have NOW will be GONE if the Restore Internet Freedom Act passes -- you will have the speed you remember from years ago; you will have inconsistent speeds and irregular latency -- a horrible step backwards in internet connectivity for all of us. AMERICANS: DO THIS FOR YOURSELF NOW - RIGHT NOW - THIS MINUTE! The video game industry revenues in 2016 for the United States were estimated at $23.5 billion. This industry is driven by the residential consumers who use the internet to access content and interact with others through online gaming and other services available only over the internet. Currently, the largest limiting factor for successful online gaming is the latency of a persons internet connection to that online game at any given second. Often measured in milliseconds, this delay of information packets arriving at their destination has steadily gone down thanks to new technological developments and internet infrastructure upgrades over the years. By abolishing the Net Neutrality that Americans now enjoy, ISP's will have the ability to de-prioritize residential consumer internet traffic, favoring commercial consumers and therefore limiting the ability of the residential consumer to interact in the same way on the internet. This will directly impact the latency of residential customers as their internet traffic is subject to slower lanes thereby decreasing the quality of their internet experience, and could directly influence their decision to purchase or support any online gaming industry products. Online services currently enjoy success derived from the ease and speed with which consumers can access their services, and if an ISP can limit that speed favoring other customers, popularity and revenues from such services may decline significantly. An industry that counts on taking advantage of the latest technological developments or the newly available internet standards in America will suffer from the inability to cater to the needs of their consumer base, namely the online video game player. Popularity in general could drop due to the unreliability that a lack of Title II Net Neutrality rules could pose to an online game player's internet connection in an online game or internet service.